We left London in the early hours of the morning, wearing puffer jackets. We flew over the alps, covered in snow. Then we landed and met mid-20 degree heat and sunshine as we stepped off the plane. We were very pleased. After finding our hotel we dropped our gear and went out to the piazza to celebrate with a beer in the sun, while we waited half an hour for our room to be made ready. Coming back to get ready for the evening we noted a very heavy police presence and speculated that the city must get pretty wild on a Saturday night, only to find the cause right outside our hotel – big riots, protesting the number of foreigners in Italy. The riots turned out to be quite civilised, actually. The BBC coverage showed an angry guy with a covered face throwing a flare, or something, but we thought that made it look much worse than it actually was. After hurrying upstairs and watching out the window for a while, we decided it wasn’t too rowdy and ventured out for a closer look. All the policemen in riot gear blocking the little side streets looked intimidating from the main road, but it turned out that they didn’t mind anyone who wasn’t rioting just wandering through their blockades. They didn’t even mind me taking a bunch of photos while I was standing in between them all. My favourite part though – all the cafes on the main path had the usual dinner crowds sitting on the pavements outside. As the rioters got near, the waiters would drag the tables inside out of the way, wait and watch from inside, and as soon as the last people waiving flags had gone by they’d just pull the tables back out and carry on like nothing had happened. Very Italian. After we realised we wouldn’t be witnessing the start of a major European revolution, we got bored and wandered off in search of something else to see. 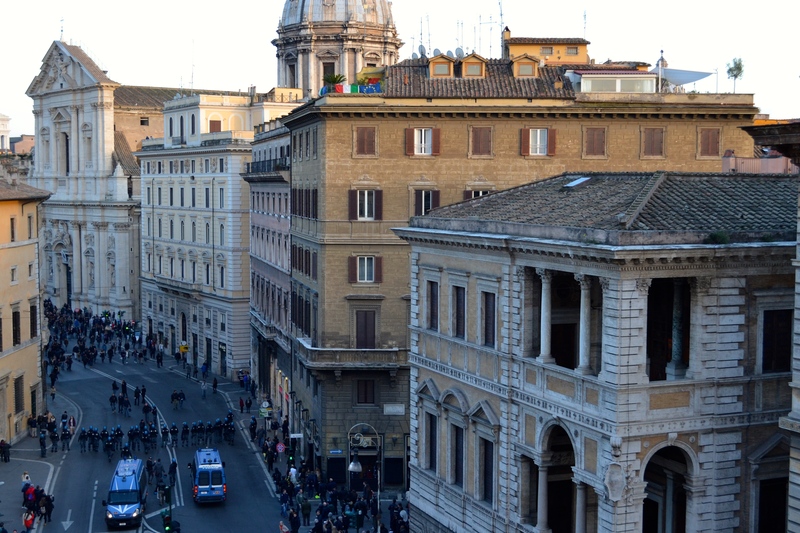 Our room was just off the southern corner of Piazza Navona, and just a block or two to the east we found one of the great sights of Rome – the Pantheon. The doors were blocked off for something private, but it was still really cool to see in real life for the first time, if only from the outside that evening. 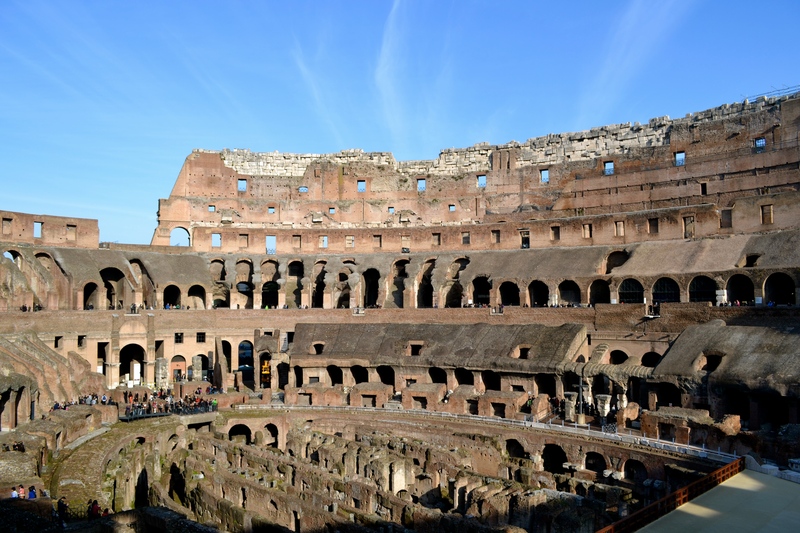 Fun fact: while it looks from the outside like it has survived a natural disaster or two, pretty much all the visible damage was caused by Romans stripping bits off of other uses. 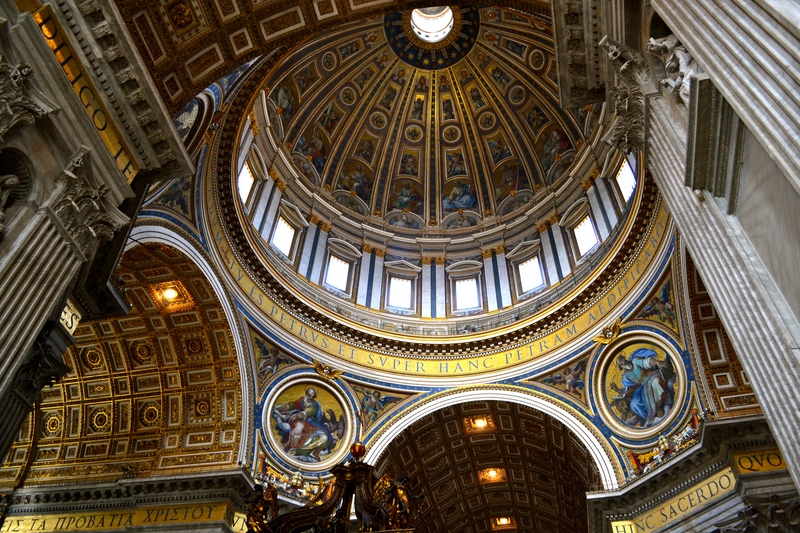 For example, the roof was originally covered in bronze, but that was pulled off and reused to make the baldacchino in the middle of St Peter’s. Some of the original pilasters (a purely ornamental column) ended up in the British Museum. 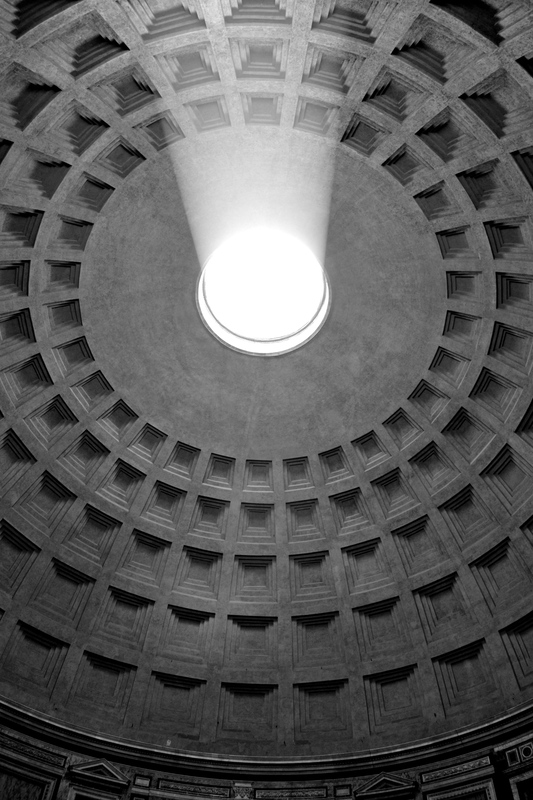 For centuries, the poor Pantheon was one of the many great old buildings of Rome which were essentially treated as a quarry by later generations. We walked up to the river and crossed Ponte (bridge) Sant’Angelo, in front of the Castel (castle) of the same name, where we found something which made me inordinately excited – a live film shoot base for the new James Bond movie, ‘Spectre’. And not just any shoot, either. 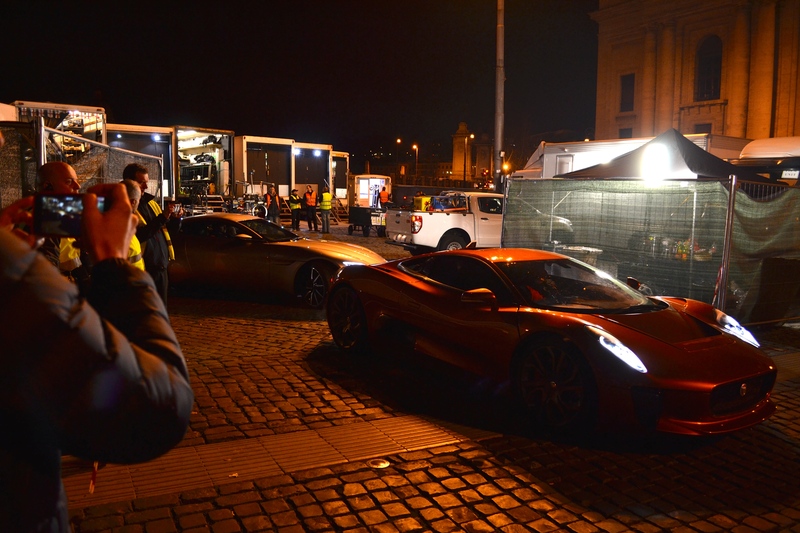 We’d found the base for the epic car chase through the streets of Rome, and sitting in front of a backdrop of St Peter’s basilica were about 16 custom Aston Martin and Jaguar cars. We must have waited about 40 minutes there to see something happen (accompanied by a bunch of other excited guys and their less than enthusiastic girlfriends, for whom standing in front of a fence looking at cars had probably not featured as part of a dream trip to Rome), and we were eventually rewarded by a convoy roaring off into the night to film. So worth it. Look out for us when Spectre comes out. 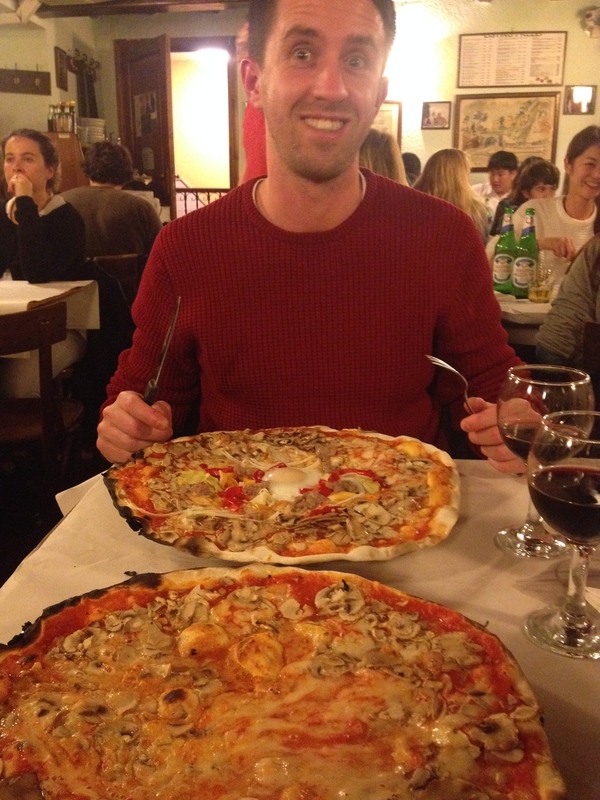 A light dinner and stroll around Piazza Navona later, we headed back to our apartment for another fun surprise – a pipe had burst and the whole room was flooded. I mentioned earlier that we had to wait a little to get the room when we arrived, which was because they were just finishing off a brand new bathroom refurbishment. The tradesman did a great job with that, because it was one of the new pipes leaking like crazy. Fairly predictable for Italy, the numbers we’d been given by the lady managing the apartments didn’t work, so we put a bin under the direct leak, blocked off the doors with towels, and just went to sleep. We ended up getting a new room at the same place the next morning, so all was well (the lady kindly said “you won’t be blamed for any of the damages”. Thanks…). 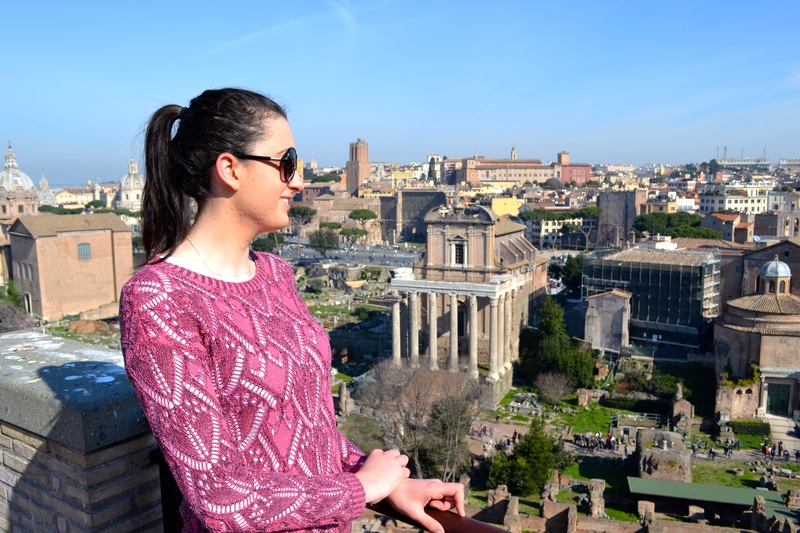 We had big sightseeing plans for our second day in Rome, so we got up early to make the most of it. 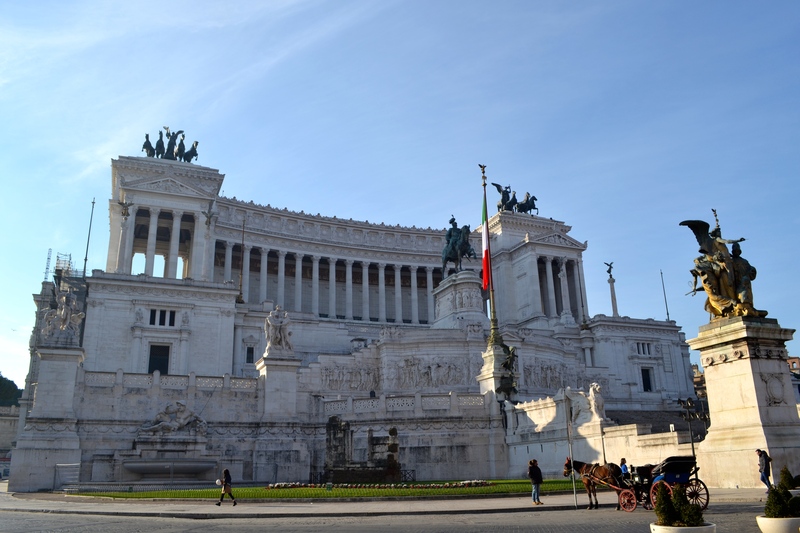 Our first tourist stop was in front of Altare della Patria, but to get up close we needed to negotiate the giant roundabout in front. There are about three or four lanes (I say about as there isn’t any road markings) and no traffic control, so crossing it really does require a bit of faith – you either have to wait for a proper gap (there never will be one), or just walk out and hope the cars stop for you. They do, to be fair – we didn’t get run over even once – but only the cars which would actually have hit you. Other cars will keep zooming across in front and behind you. Older Americans in particular didn’t seem able to handle this system, and we saw a couple of groups who had somehow made the centre of the roundabout and seemed resigned to a long stay there. Anyway, Altare della Patria. I liked it, I think as a modern addition it sits nicely with the ancient buildings around it. It did stir controversy at first, because a medieval neighbourhood had to be demolished to make enough room, and also because most of the Romans thought it was ugly, but today it looked very nice in the morning sunshine. 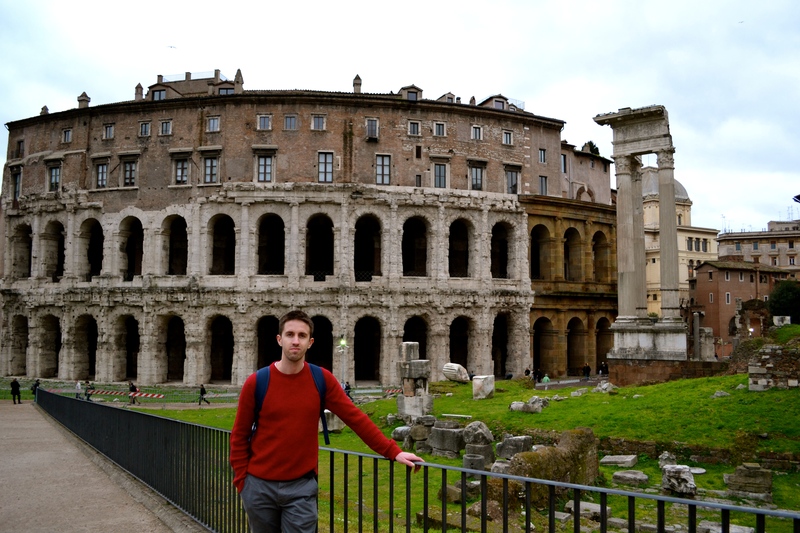 Next up was the most popular tourist destination in Rome, the Colosseum. This was the reason we’d gotten up so early, as we really wanted to beat the worst of the crowds. It was definitely a very impressive sight to see in the early light as we wandered down the road towards it. As it turned out quite a few others had the same ‘beat the crowds’ idea, so there was a crowd (although nothing on the lines which had started to form on our way out. Top tip – go very early for the best time), but our line disappeared quickly enough. There was also a nice surprise waiting at the ticket booth: free entry! [note from B – it was not actually a surprise for me. We specifically went on this day because it was free). For whatever reason the first Sunday in every month is free, so see it then if you can and save yourself 16 euro. Inside it was of course quite awe-inspiring, and even just a little surreal to finally be inside one of old wonders of the world, which we’d both heard so much about. It is just worth a note at this point to say that again, most of the visible damage was inflicted by Romans rather than time. Large parts were then subsequently repaired, so it is difficult to know how much of what remains is original. None of this really detracts much from the experience though, and we both loved it. 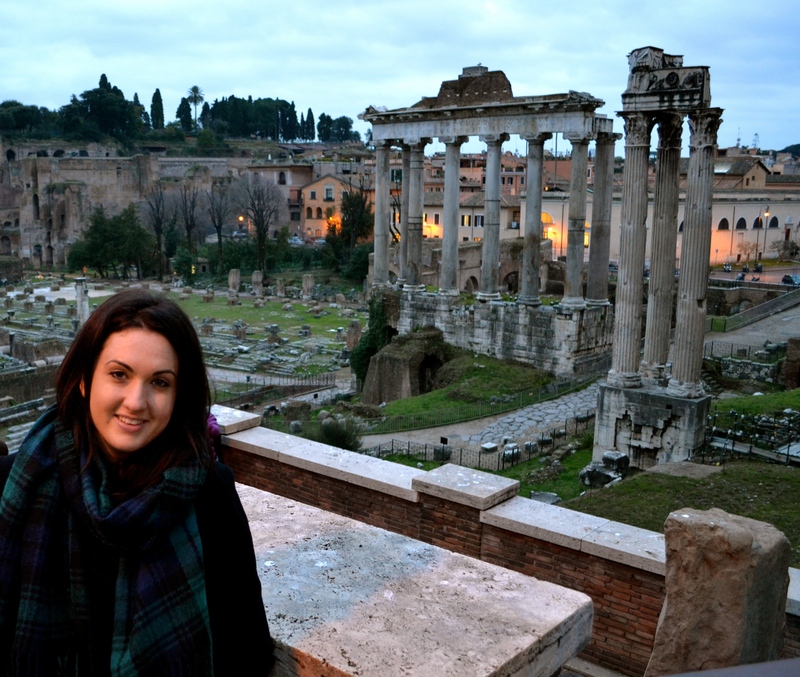 Right beside the Colosseum is the entrance to the Roman Forum and Palatine Hill, which were both also covered by our free ticket! The Forum, originally a marketplace, is now a large rectangle surrounded by the ruins of what were once many grand and important government buildings; and the Palatine is one of the main hills of Rome, the place where many Emperors of Rome used to live, and for us, somewhere with some pretty sweet views. For anyone who loves ancient history this is probably one of the best places you’ll ever go, with many of the buildings being over 2,000 years old, and you can even watch some active excavation and restorations on your visit. We saw enough to keep us happy just strolling around, and before we knew it the entire morning had gone and I needed some lunch (spaghetti carbonara). After lunch we headed back up north towards the next monument on our hit list, the Trevi Fountain. Trevi is massive, and very well-known – if you Google it for a proper look and it feels vaguely familiar, it is more than likely because you’ve seen it in a movie scene before. This was one of the things B was most looking forward to seeing, but unfortunately it wasn’t in full glory due to some renovation work. Less than that actually; you could hardly even see it. The fountain itself was drained and there was a temporary walkway leading over the usual stepped seating area to take people close to the sculptures, but these were pretty much totally covered in scaffolding. Oh well, can’t win them all. It was actually quite nice to see it undergoing renovation work at all. 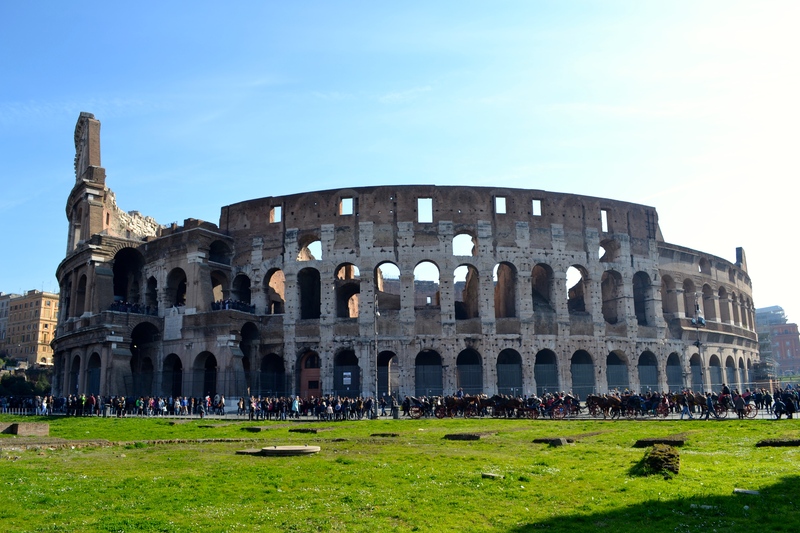 Italy, despite having such a wealth of amazing history (they have more UNESCO world heritage sites than any other country), generally spends only a relatively tiny amount of money looking after it all, and even less since the financial crisis. 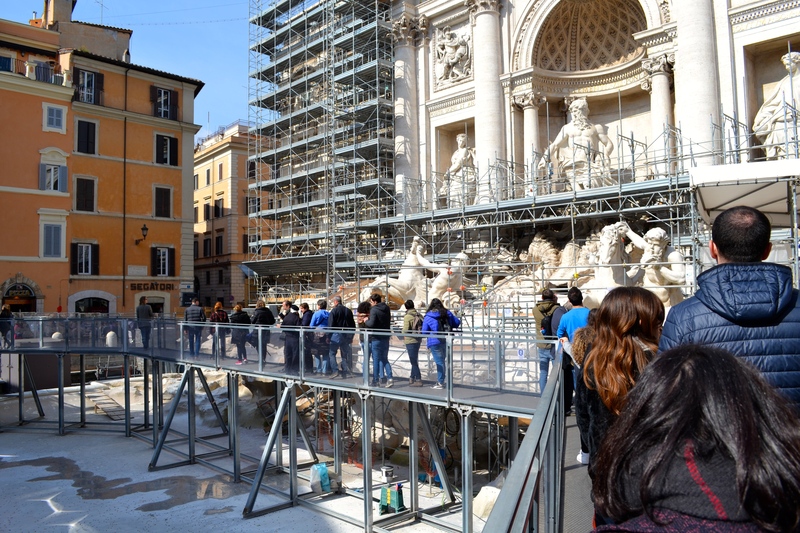 Trevi was undergoing work thanks to a newish Italian trend – the fashion brand-sponsored renovation. Fendi, the giant handbag and luxury goods brand, committed 2.5m euro to the job, and in return are allowed to display a modest plaque on the wall next to the fountain for four years after completion. 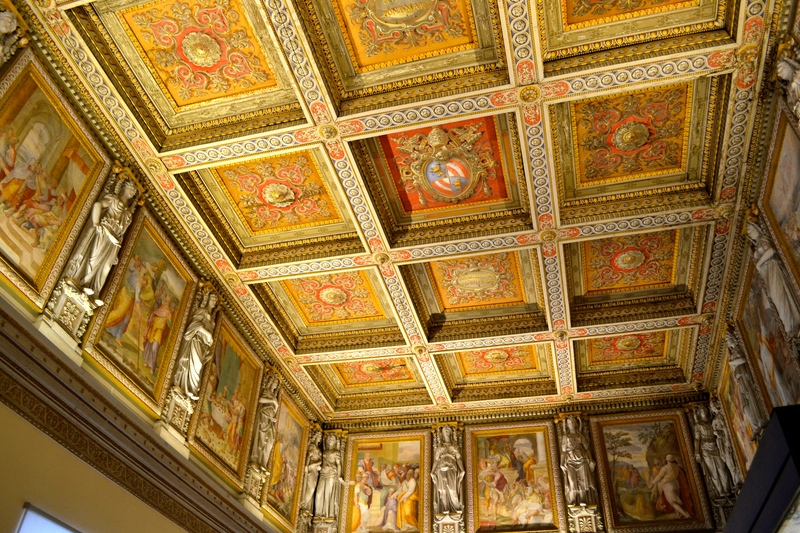 Elsewhere, Tod’s contributed 25m euro towards helping the Colosseum remaining upright; and in Venice, Diesel is restoring the Rialto bridge for about 5m euro and Prada has put an undisclosed amount towards making one of the grand old palazzos look nice again. I only found out about this after we got home, but I love the arrangement – the brands get their marketing and Italy keeps the best of it’s heritage. Trajan’s Column was the next thing we stumbled across. 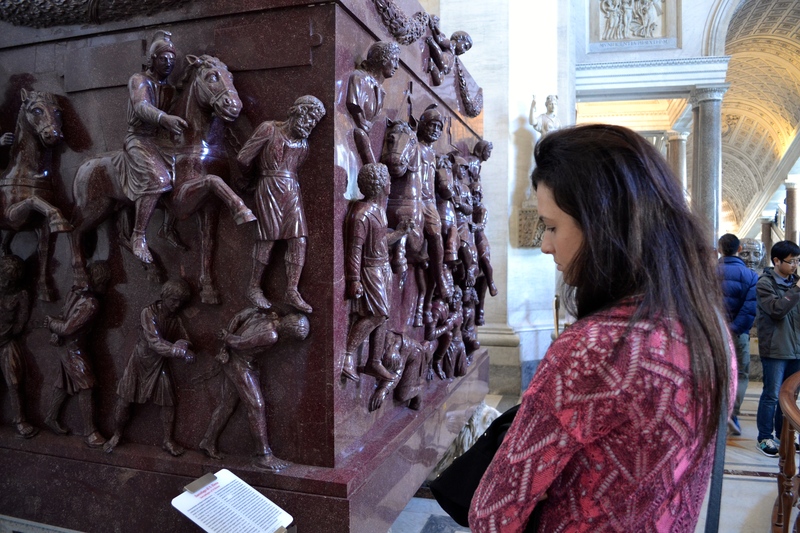 Such is the number of incredible works of art scattered around Rome that B had read a little about it and I’d heard nothing about it at all, but it is actually pretty cool so I shall tell you a little about it now. 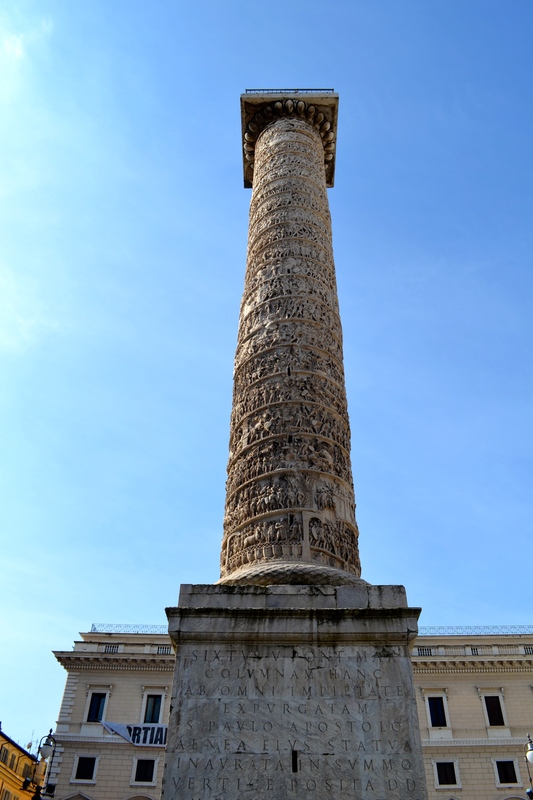 The main feature is 190m long frieze winding its way around the column itself, depicting the emperor Trajan’s victory in some wars. It looks kind of small in amongst all the buildings, but it definitely isn’t – the column is made of 20 marble slabs, each nearly 4m across, and weighing 32 tonnes each, and the whole thing is capped by a 50-tonne block at the top. 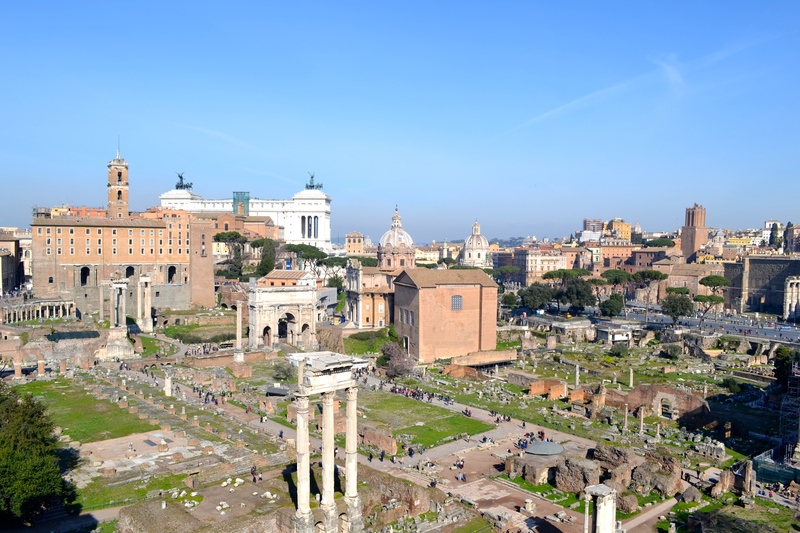 How did the old Romans get it up there? No idea, but I’m always impressed by that sort of thing. We didn’t end up walking around it enough times to follow the story the whole way through (Trajan wins, I assume), but it is worth a visit while in Rome. Middle-aged American tourists are great. The bar itself is a good choice though to escape the crowds and do a bit of people watching from up high, so check it out if that is what you’re in the mood for. Our last stop for the day was the top of the hill over the Piazza del Popolo. 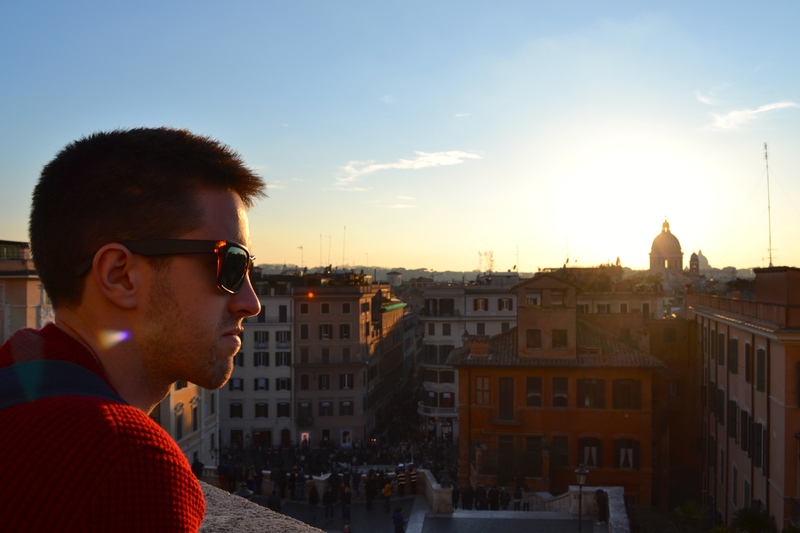 We timed it perfectly and managed to catch the sun dropping over the horizon from what might be one the best spots in Rome. Crowds were light, street sellers were marginal (although still there and still pushy) and there were some great buskers playing music. 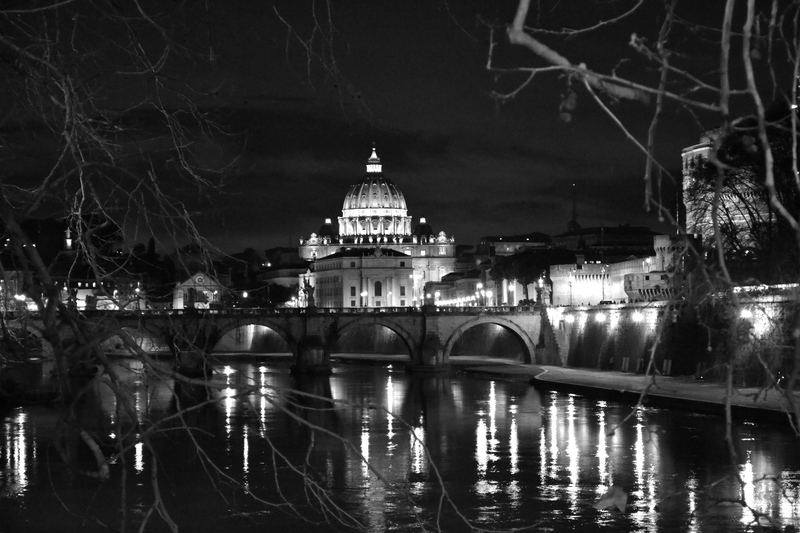 When in Rome – put a timer on your phone to make sure you get here at the right time. Dinner time. I love Italian food so much that I genuinely think I must have a little Italian in me somewhere in the past. Old Bear was our destination tonight, after a recommendation from B’s aunt Meredith (thanks M). Restaurants and bars on any main street all seem to have nice food, but are also all always filled by tourists. Old Bear is reached via a few little side streets north of Piazza Navona, away from most foot traffic, so it is a little more local-feeling. I think we were actually the only English speaking people in the place, which I just love – I always find it cool to have a buzz of conversation around me over a meal, and being able to understand none of it. Old Bear itself is small and cosy, the service was excellent, and as a spaghetti carbonara aficionado, I can safely say mine was the best I’ve had in Italy. High praise. Go there for a meal – here’s the link to their website. We walked some more, ate some more (cabornara), had more coffee and saw a bunch more old things, and before we knew it the day was actually almost over. We only realised on top of another hill overlooking the Roman Forum, which incidentally turned out to be quite a nice spot to take some photos as the sun started to go down. 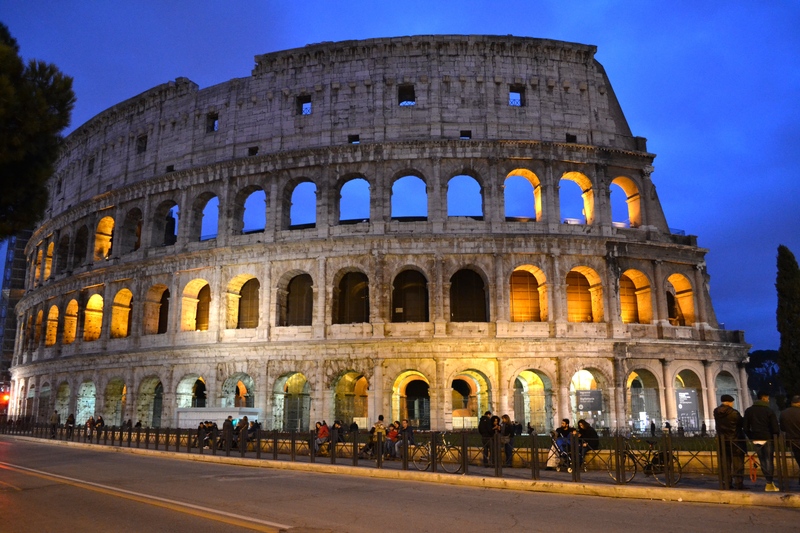 Inspired by the results of our amateur photography, we decided that before dinner we would make the rather long walk back down to the Colosseum to try our hand at some more night shots. Was it worth the effort? Definitely. The place looks amazing just after dusk and nice photos are easy to take, but once we’d finished that it was just a really nice time to be there. Beautiful spot, hardly any tourists and street sellers – I think the hour or so we spent there was probably my favourite of the whole trip. For dinner that night B had researched a fun little pizza place for us to hit up: Pizzeria de Baffetto. There can apparently be lines for this place, but we walked straight in and got seated shoulder-to-shoulder with our dining neighbours on long bench tables. It is a fairly basic set-up, but perfect for a fun, relaxed time, and that’s exactly what we got. The waiters were hilarious, messing around with each other and cracking jokes the whole time (if you check out Tripadvisor you’ll see a lot of reviews, Canadian and American in particular, cautioning against rude waiters. Don’t believe them. 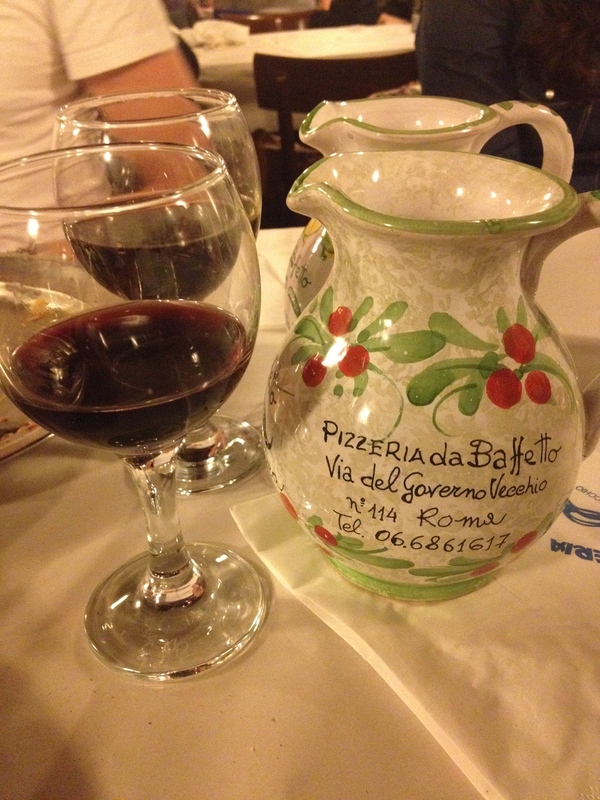 Neither country has a sense of humour is all), and you’ll get started off with cool little jugs of wine while you decide on a pizza. On the pizzas: they look massive, but the crust is so thin it is basically all topping. So get your own, because when you try them you’ll definitely not want to share. They are fantastic! 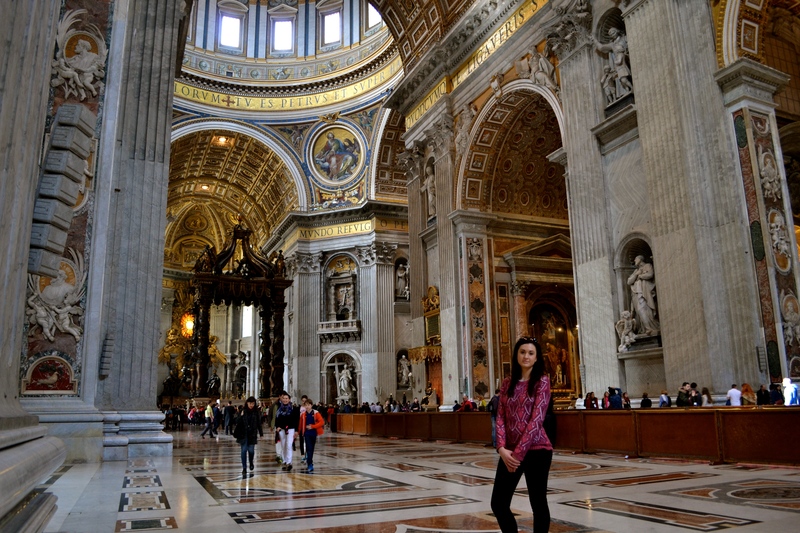 Day four was Vatican day. We’d booked ahead of time from London, to make sure we actually managed to get a slot while we were there (as apparently it can get very busy). Once again, we booked early, and once again, looking back, this is definitely the way to do things. It got more crowded as the day went by, but we had close to free reign of things when we first arrived. 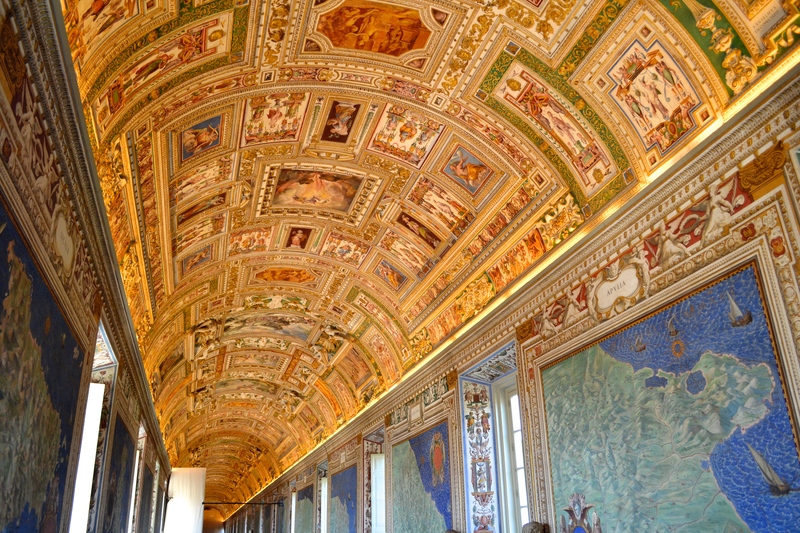 We started off with the Vatican Museums, saving St Peter’s Basilica for last. Highlight – the Gallery of Maps. This is long corridor painted the entire way down with maps of the various areas of Italy, overlaid by a stunning ceiling work the down the full length. We even found Volterra, our little town from Tuscany where we spent a great couple of weeks. There are probably better single works of art in the Vatican, but in terms of first impressions this one is hard to beat. Before we get to St Peter’s, a note of caution. 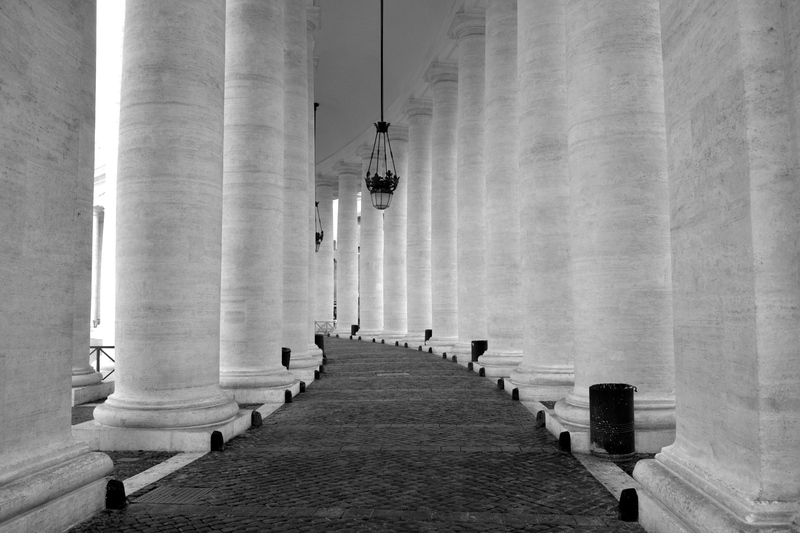 There are a ton of con-artists all around the outside of the Vatican, so watch yourself and watch your possessions. We had a guy trying to sell us discounted tickets to the Basilica, who looked very official in his lanyard and hi-vis jacket, but it is a total scam as entrance is always free (thanks to B for looking into that before we went). We hassled him a bit and passed on, but I’m sure an awful lot of people would hand over money to that sort of thing. Anyway. 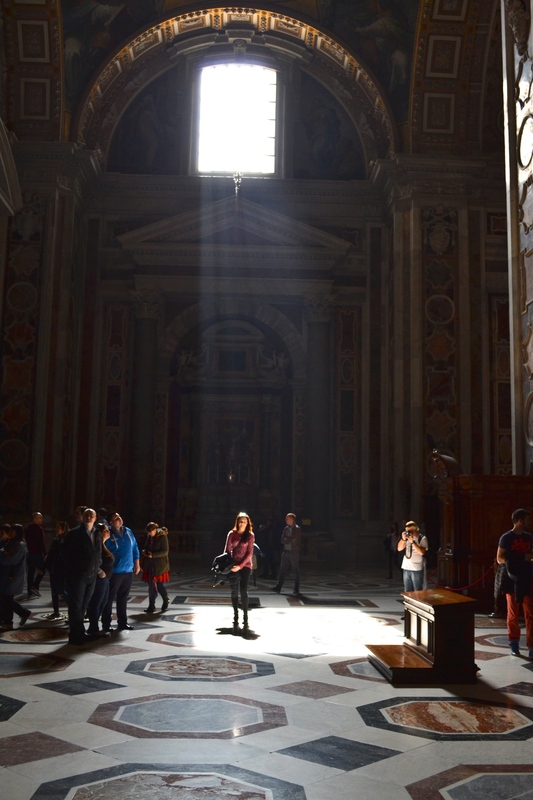 St Peter’s Basilica, in a word: awe-inspiring (I’m counting that as one word). It is just so big. It didn’t seem too crowded when we first got inside, but we realised shortly that was just because individual people just disappear in the scale of the place. Consider this: it is 220m long by 150 wide. May not sound much, but when you consider that you’d lose two football fields in the length you start to understand the size a bit better. The top of the dome is 73m high, and 42m across. The baldacchino, which sits under the dome, looks pretty reasonable but is in fact more than half the height of Niagara Falls (on average). It is a seriously big building. We spent at least 45 minutes just staring around and taking it all in. 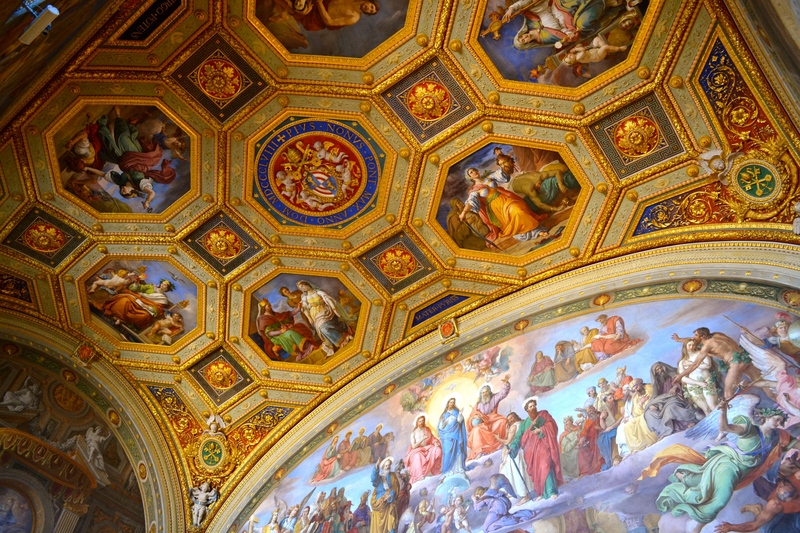 We’d left it to last on our Vatican visit, and I would recommend doing the same; nothing else would seem quite as impressive if you saw it just after St Peter’s Basilica. After that, we did very little for the rest of the day. We’d seen everything we’d especially wanted to from Rome, so mostly we just wandered around and enjoyed the sunshine (it has turned into a glorious day). After a while we ended up back at the Spanish Steps again, which, either due to time of day or day of the week, were a lot less busy than when we’d last seen them. We sat down in the sun, it was so agreeable we ended up taking turns to have naps, one dozing while the other watched over them and our gear. How cute. Our last morning in Rome. We didn’t really do much more than wander around and sit and enjoy coffee, aside from one notable event. 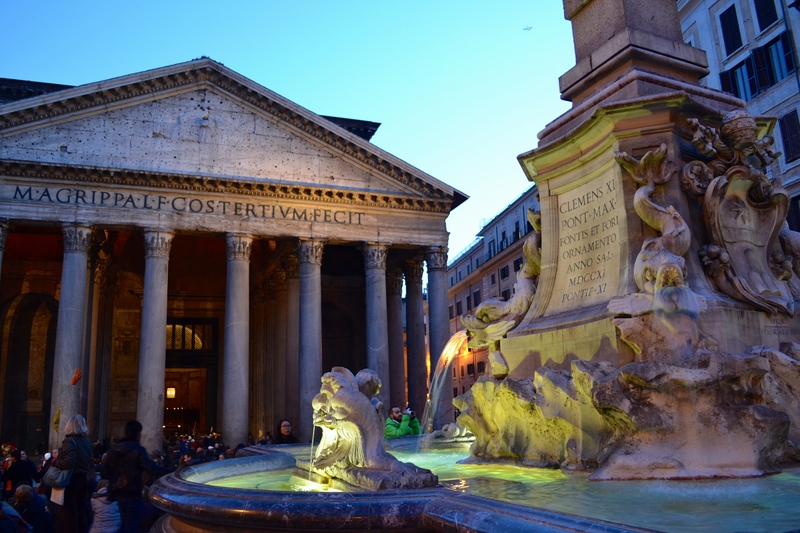 We went back to the Pantheon (we’d actually been in a few times on our wanders as it was so close to our apartment, but rather than repeat on it I thought I’d just save it for the end, and this story) as part of one last tour of our neighbourhood before leaving for the airport. The Pantheon is impressive enough all by itself, but while we were standing inside against a wall and taking it all in, a visiting American choir group formed ranks and broke into song right in the middle. Well, it was magical. There’s no better place to hear a choir than in a grand, echoing place like that, and while I’m certainly not religious I still found the whole thing very moving. Perfect timing on our behalf, for our last visit. And that was all we had time for. We went back to our apartment, grabbed our bags and started the journey out to the airport. We decided to walk to the bus station, mistakenly, as B had selected a rolling carry-on bag with a broken wheel and I ended up carrying it for the full 1.4km walk. Never mind. 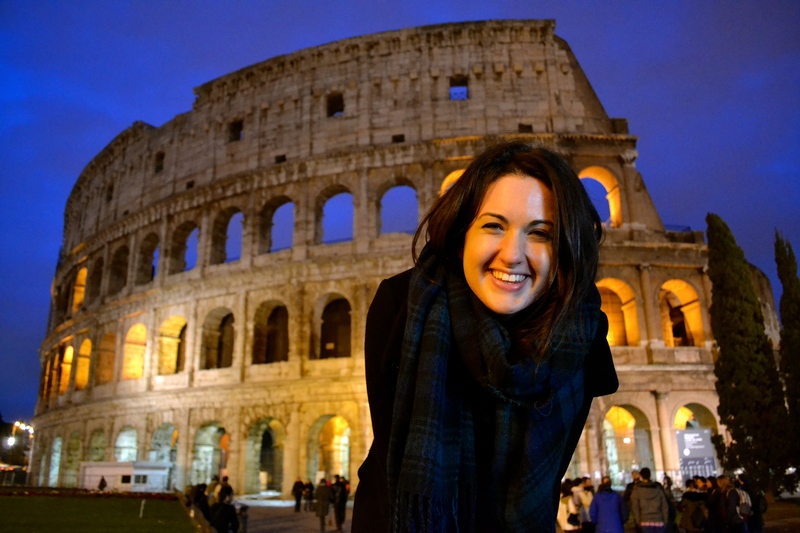 Rome was awesome, and, for both of us, only added to our love of all things Italy. Ciao for now.